Nimi Izulu is a versatile artist with talent that includes sculpting, textile designing and painting. Izulu is instrumental to the emergence of paintertainment in Nigeria and does photography for fun. His art exhibitions can be categorised into two types – the first of him coming on stage to paint. He leaves the audience intrigued about his performance. The other type also has him on stage painting. After he’s done, he interacts with the audience on the inspiration around his work. 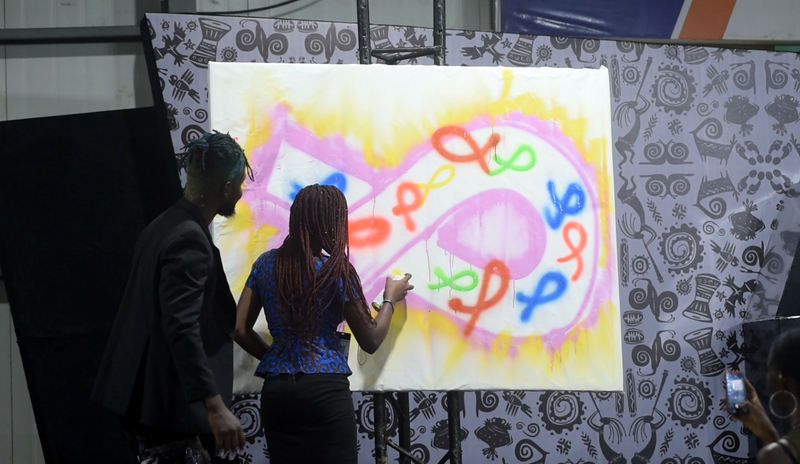 Izulu is the name behind the paintertainer session held at the African NXT mainstage. Izulu began to paint on a black canvas with white paint which took on the form of a bird taking flight. This work began taking shape until it was finished and the gathered audience were asked to take a guess of the entity on canvas. Izulu hinted about the picture being of a Nigerian politician who held sway over the country’s socio-economic scenes in the early 1960s. Someone in the audience finally got the answer right, identifying the face in the portrait to be the late Chief Obafemi Awolowo. He went on to explain how Awolowo was not a president but is being remembered as one. Awolowo was an iconic Nigerian with a law degree from the United Kingdom as a lawyer and his nationalist movement towards Nigeria’s independence. He enjoined all Nigerians to use their PVC – Permanent Voter’s Card – as their voice towards a better government. Izulu let the audience into his personal life by telling the story about how cancer claimed his father’s life. He admonished the audience to take health seriously and to always get regular checks when there are symptoms. He emphasised prevention being made the ideal of our existence and not cure. In memory of his father and celebration of the World Cancer Day, Izulu made an art with the cancer symbol. He went ahead to invite several people in the audience to pick a colour to spray within the artwork. He put this artwork up for sale after which the proceeds would go to Cancer Awareness Foundation.